Did you know that you can create custom WordPress admin pages with Cusmin? Custom admin pages are useful when you want to show some content to your users in the WordPress admin panel. It could be a help documentation, intro description, FAQ or legal documents. You can add images, tables or formatted text like you would do in your regular posts. 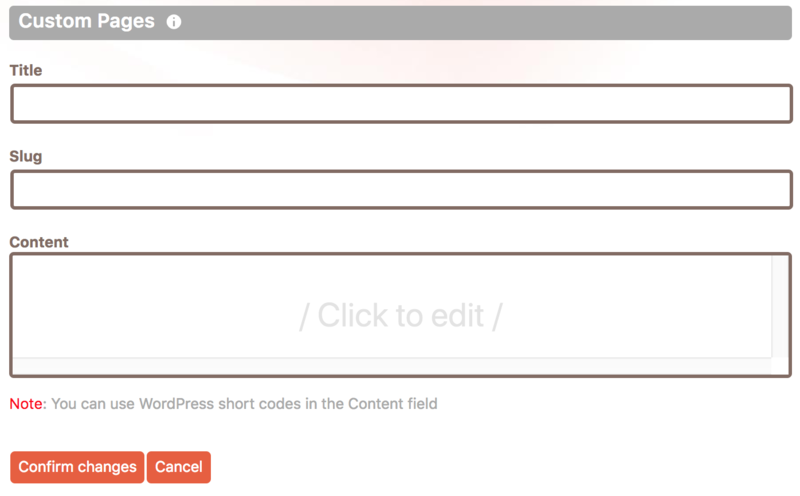 Cusmin custom admin pages support shortcodes. Fill in the Title field with your custom page Title. The Slug field will be filled in automatically. You can leave it like that or change it to your own. Click on the Content field to add your custom page content. Modal WYSIWYG editor will appear. Add custom content and click on the Save button. The modal window disappears. Click on the Cancel button to skip saving the form. You can add content like images, tables, text in different formats, short-codes etc, like you do with your regular blog posts. Note: Clicking on the Confirm changes button will not save the changes to the back end. The changes will be preserved only after clicking the master Apply button. Click on the edit button (pencil icon) next to the menu item in the Cusmin Admin Menu Editor. There you would be able to fully customize your buttons. You can even change the order of your custom buttons. Note: By default, Cusmin will set button names as the title pages. You can change button names here and use custom names instead page names.